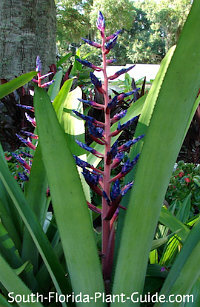 Bromelia, Aechmea, Billbergia, Neoregelia spp. 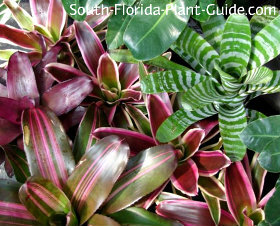 Like jewelry for your garden, a bromeliad can be small or large, subtle or spectacular, and it's a breeze to grow. These plants come in a rainbow of exquisite color choices - ranging from bright pink centers to all red leaves to zebra-striped foliage. Welcome to low maintenance gardening at its finest. This plant needs little more than the right location and a bit of water now and then. These plants form a circular center usually called a cup. This cup collects rainwater and organic debris that nourish the plant. From out of the cup emerges either a medium to tall showy flower - or there will be tiny flowers down in the center of the cup. The taller flowers can last a long time - even many months - before fading. 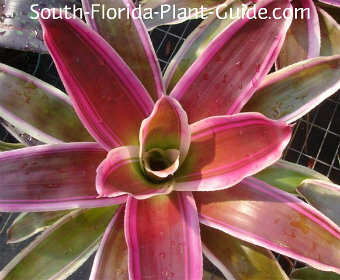 Most South Florida bromeliads aren't long-lived...they usually live anywhere between 2 to 4 years. 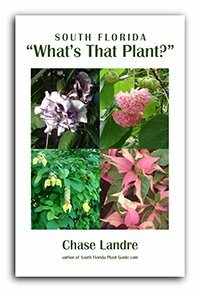 Once the plant matures and then blooms, it will begin to die and be replaced by the offsets - called "pups" - that have grown out of the mother plant. By then the pups will be about half the size of the original plant. You can remove pups at the base when they're about a third the size of the main plant to encourage the original plant to produce more of them, if you like. The pups themselves can be grown as new plants. A relative of the pineapple plant, this plant may have spines along the edges of its leaves, so keep this in mind when placing close to a walk or path. It's a good idea to wear gloves when handling. 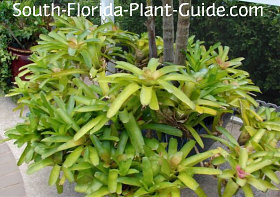 Some varieties are epiphytes (air plants) and don't even need soil to live. They can be tucked into the crotch of a tree or into palm leaf scars (called "boots), rather than planted in the ground. Ask the nursery when purchasing a plant if it will grow this way. 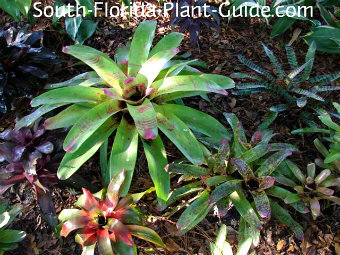 A bromeliad should not be placed where other plants overshadow it. Large ones can be used as accents but small ones are low growing plants that may be overtaken by nearby greenery. These may do better in a bed specifically for this type of plant. One of the benefits of a dedicated bed is that you can move the plants around at will, without damaging them. Their root systems are shallow, and sometimes removing a mother plant that has bloomed and died leaves room that can be filled by moving a few plants around. Depending on variety, these plants will grow as low as 6 inches or as tall as several feet. All do fine in bright shade, and some can take sun - even full sun - which can enhance their coloration. Bromeliads do best in Zone 10. However, they make excellent container plants, so in Zone 9B they can be planted in pots and moved in during cold weather. This is a superb plant for low maintenance. Once planted, it needs little attention. No soil amendments are necessary when planting...these plants have very little in the way of roots. 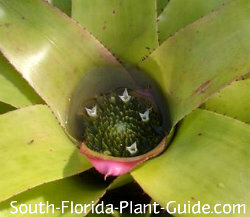 Be sure the area is well-drained - a bromeliad in a wet area will rot and die. 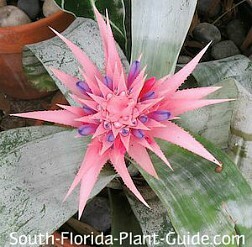 A bromeliad is a drought-tolerant plant - though it loves humidity. If nothing else, water during dry spells. 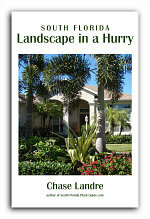 Ideally, irrigate the area on a regular basis but don't overwater. Flush the cup occasionally to clean the area and remove mosquito larvae. No trimming is needed. No fertilizer is necessary either. Place these plants 1 to 3 feet apart depending on variety. You'll need to leave some space for pups to emerge and spread out. Come out from the house at least 2 feet. Come in from drives and walks 3 feet. These make fantastic container plants. The pups will spill out over the edge of the pot and circle it like little satellites. 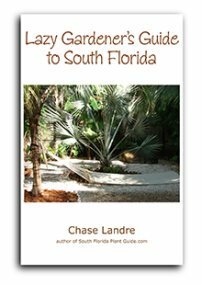 COMPANION PLANT SUGGESTIONS: Coontie, foxtail fern, firespike, Aztec grass, cordyline and dracaena.